I love free stuff, and I especially love when I can give it away! Chances are you’ve probably heard a bit (pun intended) about the Fitbit activity watch. In addition to being a great watch to monitor your daily exercise habits, the fit also comes fully equipped with a sleep tracker to monitor your sleep habits. You can use this information to help you better understand how you’re sleeping (or not) and begin to adjust your sleep habits, resulting in more restful nights. 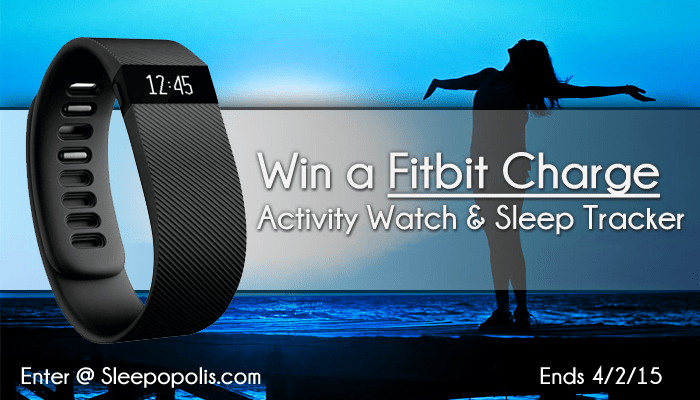 Prizes: Two (2) Fitbit Charge Activity & Sleep Tracker watches. Two winners will be selected. Each winner will win one (1) Fitbit Charge watch. Valued at $129.95 / each. Entries: You may enter up to 10 times, one for each entry method defined above. Only entries verified through the Gleam voting widget above will be counted. Winner: Two winners will be randomly selected based on the pool of entries at the conclusion of the giveaway. Winners will be contacted by no later than 4/5/2015. Winners must provide a US address to be able to claim their prize. Winners will be contacted via email. You’ll have 48 hours to respond to the congratulations email to claim your prize. Non-response will be viewed as a non-valid email and a new winner will be selected from the pool of entries until we have two winners. Eligibility: US residents within the continental United States (excludes Alaska & Hawaii). Must provide valid email address and valid mailing address. Cheating: Voting manipulation and spam attempts will automatically be invalidated. This giveaway is sponsored by Leesa Sleep. They are the #1 ranked mattress on Sleepopolis and a great mattress choice for almost any sleeping type. This giveaway is sponsored by Leesa Sleep! Notice: The product names and logos shown on this site are the trademarks of their respective owners. Sleepopolis is not endorsed or sponsored by Fitbit Inc. The Sleepopolis team is all about helping you sleep better. Whether it is through extensive sleep product reviews, sleep tips, or debunking sleep myths, we're here for you! What’s the Sleepopolis’ Platform Bed Frame? I’m starting to walk and exercise everyday and this would be a nice way to keep track of how I’m doing. Thanks! I could really use a new mattress, but with my fixed income it may be another decade before I can afford one. A new FitBit would be very helpful in keeping track of my walking to loose weight too. I got one before Christmas but it slipped off my belt and got run over in the snow. I can no longer see the screen. It does still download to my computer at the end of the day though. Would love to win one of these to see how bad am sleeping plus I have sleep apnea to and I wake up feeling like I got in a bunch Of fights in my sleep and I got beat up while sleeping that’s what I feel like when I wake up So I would love to win this even no I enter ever contest tons and never ever win ?? You think all the ones I enter you win something but anyway I would love this to track my sleeping. Thank you good Luck everyone !! We have had a Serta mattress for 3 uncomfortable years. After 6 nights we knew it wasn’t the mattress for us but there were no returns on our $1600 purchase. Recently we decided we have had enough restless nights but the unpleasant mattress shopping experience kept coming to mind. I heard about Casper on the radio and discovered Tuft and Needle through Casper reviews. I was intrigued….purchasing a mattress online, packed in a box, delivered at no charge, and a sleep guarantee to boot!! I had almost decided on a Tuft and Needle when my research lead me to SLEEPOPOLIS and LEESA. A mattress I was unfamiliar with. I thoroughly absorbed all the info Sleepopolis offered. I read every review, watched every video, and changed my mind and decided LEESA was the best choice for us. I also read reviews on other websites and never found any negative comments about LEESA. I ordered a king LEESA mattress on March 18. It arrived today, 6 days later! I’m SO excited but we have to wait until the frame arrives before we unpack it. By the way, the mattress and frame were ordered the same day. Still waiting on the frame. I’m really looking forward to a great nights sleep! Great story, Mariam! Definitely keep me posted on your experience with Leesa. I’d love to know what you think of it once you get a chance to sleep on it. What a great idea to give a fitbit tracker away! I hope I win because I had a fitbit once and accidentally washed in the washing machine! This would be awesome to win one back! I am currently trying to lose minimum 40 pounds. I recently lost 30 but was the heaviest ever and was having hard time with depression and low energy. I think having a way to monitor my day including sleep (which I have a horrible time with). I just want to get in shape to be able to set a good example for my 4 kids. This could help with my severe medical issues. Disabled and not able to do a lot during therapy. This would be a great health tracker. wow this would be so helpful, for me! i don’t sleep thru the night ever, would like to find out how with your watch. thank you for the chance !! I need this for my job. I walk an extreme amount and would love to keep a record of it for my health information. need to lose twenty would love this now! !